There is a radical difference between ideologies based on Rights versus Duties (karma). As per Sanatana Dharma, everyone deserves equal rights and essential duties in the form of Varnashrama. Sanatana Dharma is based on duties & rights as per Varna and Ashram, whereas non-Dharmic cults are purely based on rights & entitlements. The varna that I am referring to is based on guna (quality) of individual and work (karma), specifically not due to birth. In non-dharmic cults, the absence of a sense of duty makes individuals rely on empowerment from elites to exercise their rights. That is also technically referred to as an entitlement. The entitlement rights are generally conditional upon meeting some minimum community goals and standards. Often times the rights and corresponding entitlements may be changed whimsically to suit the popular demand. Duties and rights in Varnashrama go directly opposite of any western philosophy such as that of Karl Marx’s ‘fight of classes’. Varnashrama is an ideal social, economic, categorization of society much better as compared to western social philosophy. Most western philosophies are ideas which are being tested, not proven. However, the Varnashrama system has been present since the beginning of creation. In Varnashrama the rights and duties are accurately laid out. An entitlement in Varnashrama is earned, not granted. The civil rights was a big movement spearheaded by stalwarts such as George Mason, BR Ambedkar, Karl Heinrich Ulrichs, Dorothy Heights, Martin Luther King, Chaitanya Mahaprabhu and many more who successfully brought civil liberties to people they served. But the question is why they had to do that? The answer to this question is usually found in the historical acts of repression carried out in their non-dharmic ideologies. Reclaiming the rights lost to the elite was a big part of their struggle. Often times the rights of few were stolen by the elite because of a faulty sense of superiority owing to the colonization movement. Millions of natives in South America, North America, Asia and Africa lost their native rights to invading ideological forces. While native Indians & Africans lost their rights to Christian / Islamic invaders, North & South American & also African natives lost their rights to Christian ‘Civilizing Missions’, and Islamic oppression against natives cannot be even described. With this background, the civil rights leaders proclaimed a human right to live with dignity. Most of the colonization assumed that natives were a lower species and hence fit to be colonized. Faith-based colonization was a strategy used to demean local cultures and impose the ideology of colonizers. In that process, the rights and pride of local cultures were completely destroyed. Non-dharmic ideologies played a big role in providing justification for colonization. The rights of invaders were considered superior to the rights of natives. Thereby, creating a class of people who took it upon themselves to whimsically impose discriminatory policies to demean the local cultures. War, Genocide and other political tools were justified in meeting the objectives of their strategy. Islamic conquest on Hindu lands assumed that they had better ideology against locals and they freely used special taxes, violence against women/children to impose themselves on Hindus thereby usurping the rights of native Hindus. Similarly Christian conquest on Hindu / African / South American / North American lands assumed their ideology to be better than the natives. We see the effect of their faulty policies in terms of the total imposition of their belief system on the natives. South America for example, has no sign of native culture left anywhere. The history of natives was completely obliterated by colonial conquerors. There are Christian churches in every corner of South America and the European heroes are imposed on the psyche of every single South American native. The language, the culture, the habits of natives and their scriptures were completely destroyed. Natives lost not only their rights but also their identity. Gradually with social media, the rights of natives are beginning to be recognized. Church played a key role in suppressing the native civilizations. Most of the current confusions in the social structure of India can be attributed to the imposition of colonial ideologies which introduced rights based socialist ideas. India was saved from that complete destruction of culture because the roots of Sanatana Dharma are deeper and its culture of Sanatana Dharma was superior to any Islamic or Christian ideologies. Sanatana Dharma is usually the original ideology of all natives. It’s a system of natural duties or karma and belief system. An administrator, teacher, traders and skilled workers are natural divisions of society. They naturally work in harmony because each one of them is dependent on each other. The rights of each section of society are neatly laid out while the individuals follow their karma/duties/ responsibilities. One will never find one group usurping the rights of others because of a sense of duty to their profession, interdependence on other sections of society and proper delineation of their roles & responsibilities. That’s the beauty of Varnashrama. Sanatana Dharma promises a peaceful existence for all members of society because it creates responsible individuals. People are entitled to their rights as long as they work for it. Most of the times the invading ideologies demand more rights over natives. 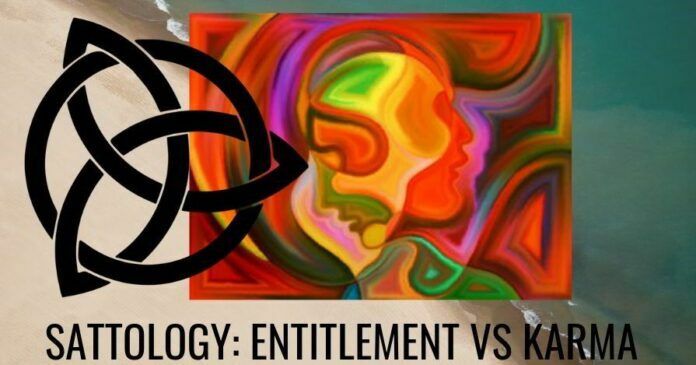 The entitlement to other assets is presumed because of their ideology. Islamophobia is a classical political strategy of demanding more rights over locals by showing invaders as victims. Islamophobia has been successfully used by Muslims in the west to gain more privileges over locals. Christian church also demands more rights for its followers in non-Christian countries. Usually, non-dharmic cults demand rights for themselves over others which creates dissatisfied individuals. The privileges mentioned in those ideologies have been modified to suit the modern expectations of society. So the rights keep evolving. Rights-Based ideology creates an entitlement based mindset. People feel entitled to certain privileges without working for them. The absence of duties or responsibilities creates immature individuals in rights only based societies. The underlying principle of entitlement based strategy is to create an unstable individual who can be easily manipulated by elites. Small nucleus families are a direct result of this faulty ideology. With broken family structures, the biggest beneficiary is the church. Nowadays the ‘rights’ lobby is very much against the word nationalism which they equate with fascism. However, nationalism is considered a virtue in Sanatana Dharma. Nationalism is a duty and as well as right. Nationalism is expected from a resident of any country for their motherland. Nationalism is a sign of gratitude. Everyone in a country should be allowed to celebrate nationalism because it is everyone’s right as well as duty. When someone claims to be more nationalistic than others, then others may appear to be anti-nationalistic which is in way usurping their rights. Just like all children have equal rights and duties towards their parents. Everyone in a Sanatana Dharma system has a responsibility to allow others to express their inherent duty of nationalism. Most of the current political problems in the world are due to a class of people who think they are entitled to their rights even if they don’t deserve it. A small minority of Sunni Kashmiri Muslims thinks that they deserve the whole Hindu and Buddhist Kashmiri state. They have been the most exploitative group in Kashmir so far against Hindu minorities in Kashmir valley. The same problem is seen in Palestine and Nigeria. A small group of Sunni Muslims trying to take away the rights of natives. Even in western countries the majority of youth feel entitled to certain privileges without having to work on that. Utopian ideas such as socialism are born from such an attitude. The society has to wake up to correct this anomaly in their education system. Rights are extremely important when coupled with actions. Just rights only create a sense of entitlement, which doesn’t go well for growing society. Varnashrama system which is based on rights, as well as responsibilities, is an ideal system for social equality. Duties and Rights are both needed for a healthy society and Varnashrama system provides that. Just rights alone without duties creates an unhealthy social structure which destroys society in the long run. Next articleAn in-depth conversation with Rajeev Srinivasan on the Foreign Policy of NaMo Govt. Mohenjo Daro – How truly does it reflect the past?